Hello Doodlebug Fans, it's Brigit here! I have a couple of cards to share with you today using Doodlebug's adorable washi tape. I had so much fun putting these cards together, washi tape is a quick and easy way to add decorative touches to any project. For these three cards, I used washi tape from the Milk & Cookies collection along with some from the assortment packs. I love pieces of washi tape with torn jagged edges place randomly on cards, so fun! 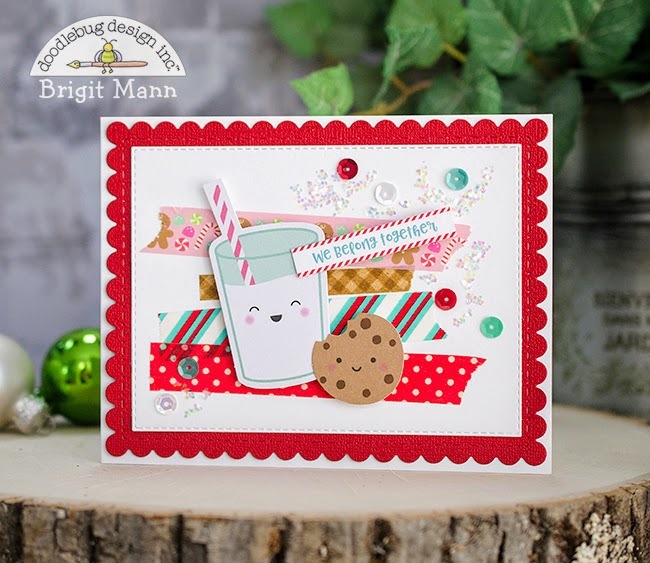 I added a couple of odds & ends from the milk & cookies pack and the santa's sweet and peppermint twist washi tape also from that collection. A piece of ladybug swiss dot and gingham from the assortment pack. I finished off the card with some doodlebug sequins and glitter. The matted red layer is ladybug textured cardstock and the sentiment is from the 6 x 6 milk & cookies paper pad. I love the simplicity of this card, it's all about the washi tape. I used the gingham assortment pack to create the diagonal striped background. The sentiment is a piece of merry christmas washi on a white strip of cardstock. The two little gingerbread men are from the odds & ends pack. For the last card I placed washi pieces on cardstock and used a banner die to cut it out, makes such a great background!! Washi used, santa's sweet, happy holidays and stripe assortment. Other products, gingerbread man from odds & ends, milk & cookies 6 x 6 paper pad, raspberry textured cardstock and bubblegum chunky twine. Thanks so much for stopping by, hope you have a wonderful day! These are just amazing ... love playing with Washi tape!! These cards are too cute!!! These are so happy and fun Brigit! LOVE them all! All these cards are so irresistibly cute !